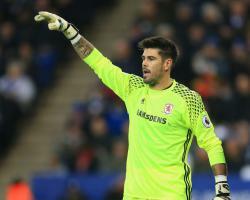 Both clubs went shopping for a new number one in the summer, with Boro landing former Barcelona stopper Valdes on a free transfer and the Reds drafting Loris Karius from Mainz. The latter is the younger man by more than a decade and seen as a long-term investment but, after 15 matches of the Premier League season, there is little debate about which of the pair has enjoyed a better start. While Klopp has become frustrated at the constant criticism of Karius, who has made several high-profile errors, Valdes has established himself as undisputed first-choice in a team that have conceded six goals fewer than any other team in the bottom half of the table. Karanka has treated with a gentler approach, offering personal advice when he started the season somewhat tentatively. "I cannot speak about what is happening at Liverpool but my experience with Victor is that he's improving a lot," said Karanka. "He's the player who we wanted to bring in because he's an amazing keeper and a leader in the changing room. He came from a long period of not playing and before that he came from Barcelona. Maybe I helped him, I had a few meetings with him and now he's doing well. I lived in my career something similar to Victor here." Further forward, the Teessiders have more room for improvement. They are the division's bottom scorers with 13 goal and could once again be without Alvaro Negredo and Gaston Ramirez, who have chipped in with five of those. Ramirez is definitely out with a foot problem but there is a decision to make over Negredo, who is keen to play but may yet be held in reserve for Swansea at the weekend. Karanka is not getting caught up on the goals scored column, though, and prefers to see the bigger picture. "We can't forget last season we got promoted on goal difference," he said. "It's not about how many you score, it's about the goal difference and the difference we have now between us and the bottom three is massive. In the busy Christmas period of this league you can't make mistakes."